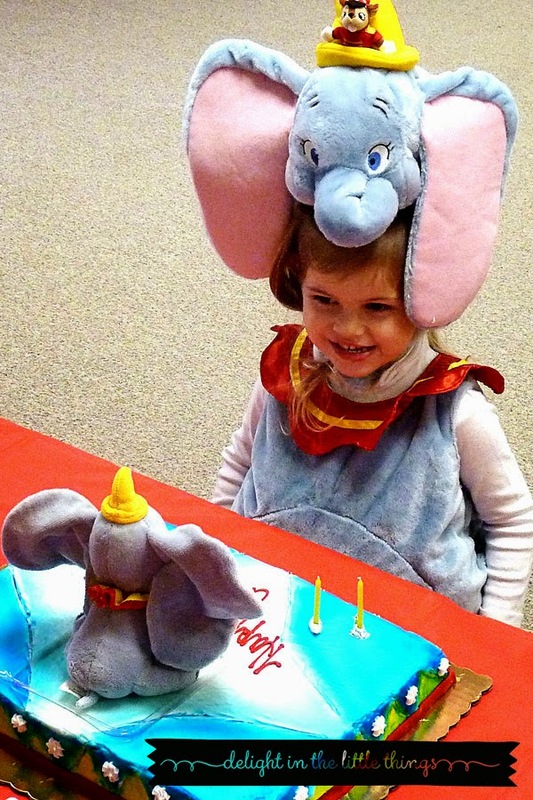 As an elephant lover, a Carnival / Circus Birthday party was the perfect choice for Campbell's fourth birthday. Especially because it revolved around her favorite character, Dumbo. Planning a party for January is always tricky, though. We knew it would need to be an "inside" party and found a great spot at our church to host lots of little guests with plenty of space for the carnival. We decided to call her party "Campbell's Carnival" and used a sweet birthday invite from Boatman Geller which featured a colorful birthday bunting. Within the text, we used an elephant silhouette image to reinforce the theme. We planned several game stations for the party, and created carnival signs for each one out of poster board. The carnival signs were easy to make. I started with red half-sheet posterboards and printed out the station/game names on 11 x 14 legal paper. This size paper centered easily on the posterboard half-sheets. I used a large circle punch to cut out yellow circles and then used a glue stick to paste them across the top. Cute signs made easy! Our games were simple so the kids could do them on their own and then we also had craft and face painting stations manned by friends. The games included things like Knock the Cans Down, Ring Toss, Beanbag Toss (I covered a corn hole game with a lion's face I painted on on foam board and cut the mouth out), and a Mystery Box. The Mystery Box was manned by my oldest daughter, who dressed a little like a gypsy. She painted an old shipping box from Amazon and cut a big hole out of one side. 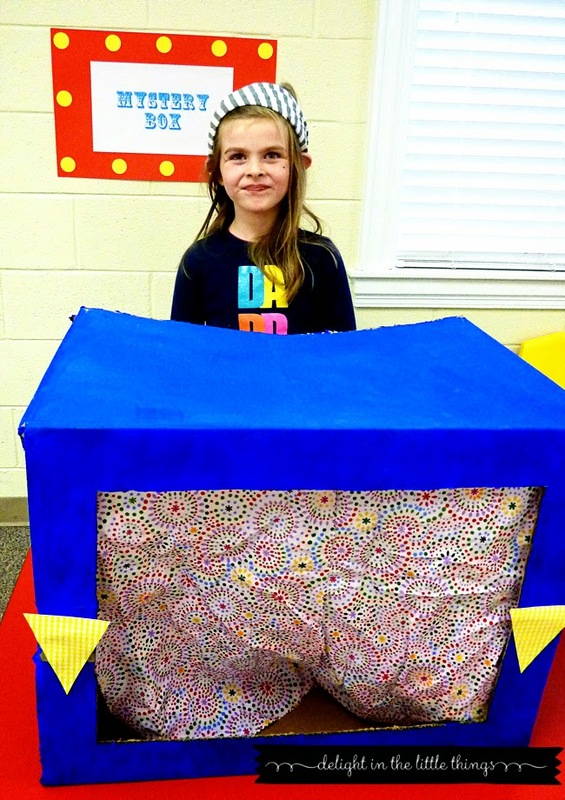 We taped some fabric in the front and she had the kids put their hands in to "guess" the name of the item. We gave the kids a stamp card, and at each station the kids received a stamp when they finished the game or craft. After going to all the games, the kids could turn their card in for a bag of cotton candy. 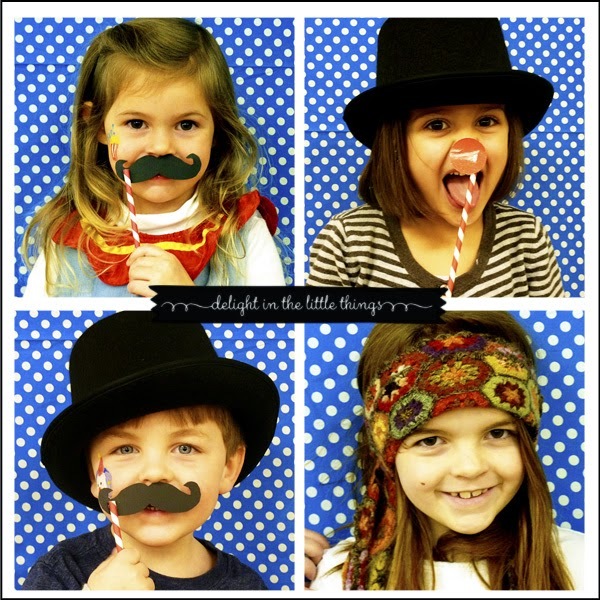 For a Carnival Birthday Party, a photobooth area is a must. This was easily accomplished with some polka dot fabric and cute photo props. I used my Silhouette Cameo to cut mustaches and clown noses and glued them on red and white paper straws. We had some hats on hand for extra fun. For party food, we borrowed a popcorn popper and a small cotton candy machine and my husband and brother-in-law helped serve up the goodies. We had animal crackers to snack on and the Dumbo cake, requested by my little one who insisted on dressing like Dumbo herself. 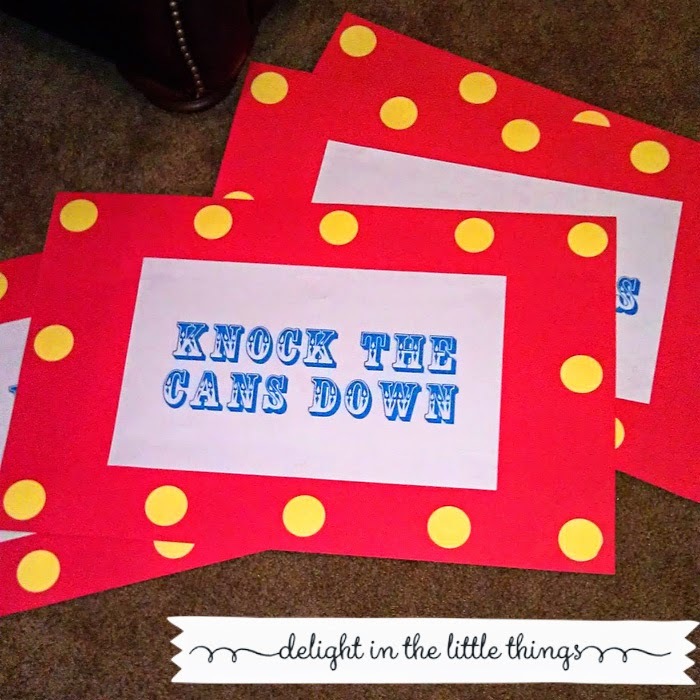 Overall, it was an easy party to plan once we focused on the bright colors and simple games that kids love. The birthday girl was a happy girl! 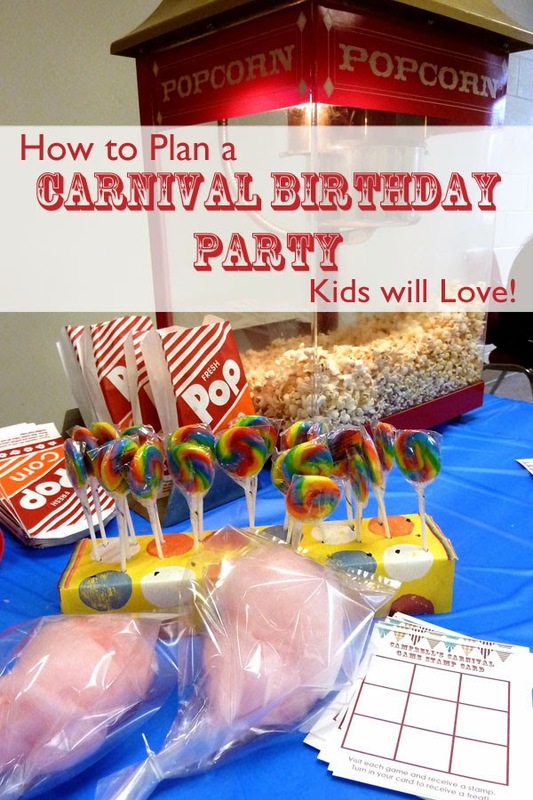 Are hosting a carnival or circus birthday party for your child? What do you have planned? If you'd like to use the Stamp Card featured above, click here for a free printable. 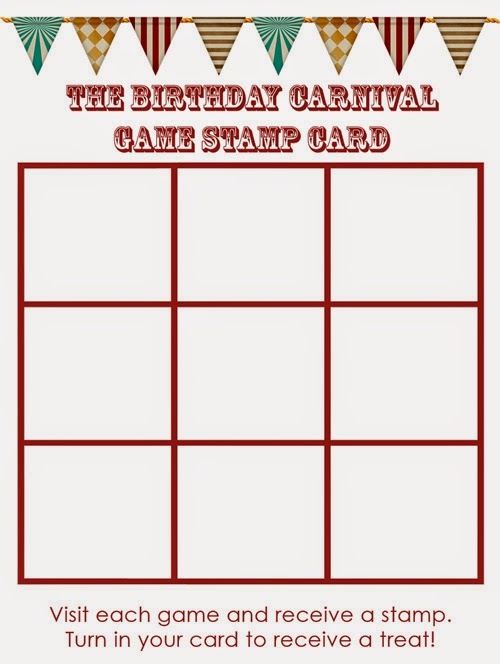 Follow Sassafras Paper's board carnival / circus birthday party on Pinterest.